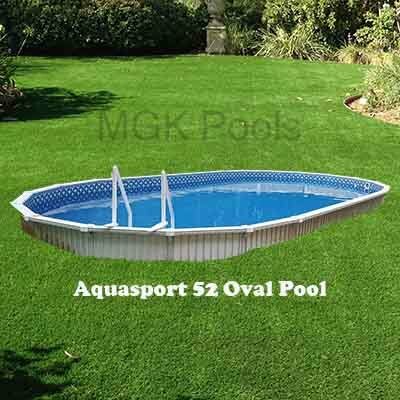 The Aquasport 52 12×20 semi-inground pool is the best you can buy. There is no stronger pool, or a pool designed to last longer. Its strength comes from the extra thick aluminum slats, which go into the construction of the Aquasport 52 wall. You could completely bury this pool if you want to. Perfect for installing in sloping yards, or for any landscaping plan. The Aquasport 52 is an all aluminum pool, except for a few components like the resin caps. The aluminum top rails get manufactured with a bead channel built right in. Making this pool like an inground pool, you don’t have to disassemble any part of this pool to replace the liner. Read more about the Aquasport 52. Standard Hayward Skimmer package with a through-wall return, gaskets, face-plates, hardware, vacuum plate adapter, plus additional butterfly gaskets. This skimmer package is everything you need to get water out of the pool, to the filter and then back to the pool. If you intend to bury the skimmer like an inground pool, we can include an inground skimmer package instead of this which works for semi-inground installation to about three feet in the ground. An inground skimmer kit would cost an extra 75.00. There are equipment maintenance packages that cost less than this one. But because you are getting it at our cost, it just adds convenience and value to this package. It comes with a 30-foot I-Helix vacuum hose, vented vacuum head, Wall & Floor Brush, leaf net, Chlorine dispensing floater and debris skimmer. The only thing you will need is a service pole to make this kit complete. This maintenance kit includes all the same equipment I use as a service professional. We do not ship service poles, as more often than not, they show up looking like a service pretzel. All Semi-Inground Pool packages ship for free. Shipping service includes: Residential or Commercial freight, power tailgate, driver assisted delivery. The only exception to this is super rural addresses, and addresses that cannot get accessed by our trucks. Then we deliver to the closest shipping terminal. You are responsible for picking up your package from that terminal in these rare cases. Now you know what components you need to make a pool package. If you prefer, you can use our custom pool package builder to build a pool package yourself. You can add more accessories, or take out items. You have total control. For help checking out, or to place an order over the phone, please call (978) 710-8667. During the season with high call volumes, it is best to email. Someone will respond as soon as possible.